Built to last while storing up to 14 guns, the 7.9 cubic feet Mesa Safe Company 14 Rifle / MBF5922E gun safe is a great investment for firearm enthusiasts. Backed by a limited lifetime warranty to ensure your money will not go to waste. The 12 gauge, all steel construction on the Mesa Safe MBF5922E ensures that no power tools will be busting through the safe. Built with 4 solid live locking bolts that measure at 1″ in diameter. Along with 3 dead bolts measuring at 1″ in diameter. The 1 ½” thick walls will not only protect against burglary, but also fire. Made with fire resistant materials, this safe has been tested for 1 hour at 1750 degrees Fahrenheit. The safe weighs 505 lbs. Way too heavy for 1 man to move, but also heavy enough that multiple men probably could not move it efficiently. To make it even harder for burglars, there have been 4, pre-drilled anchor holes implemented. This allows you to bolt down the safe to the flat surface it sits on. Rendering any attempt to move the safe useless. When you do need to move it, you can remove the door. This allows for more free movements and a lighter weight on the safe. The safe can hold up to 14 long guns without scopes or attachments. There are seven barrel notches on each side of the safe. Owners of this safe have found they can fit four long guns per side if there are scopes or other attachments on the gun itself. The interior of the safe is upholstered and comes with removable shelving making your safe completely customizable. You can move the shelving units around to better hold ammunition and other equipment. Smaller firearms, or even important documents or family valuables can also be stored inside the safe. The exterior depth of the safe is measured at 20”. For owners who are looking to keep there safe in tight quarters, it is best to add on an additional 2.5”. This will account for the decorative brass handle on the door of the safe. Also included is a power outlet, should you need a dehumidifier. USB port is also included. Some users have asked if the safe will properly house a storage unit that attaches to the door. The answer to this is both yes and no. If strategically placed, a door storage unit may be able to properly house pistols and other small firearms. If not, owners may find they have issues closing the door due to the location of the storage unit and the shelving units. Other than only sometimes being able to add a door storage unit, we had no problems with the Mesa Safe MBF5922E. If you only have a few long guns and are looking to store them safely along with other important items, this is the safe for you. A customizable, fire resistant safe backed by warranty is what you get with the Mesa Safe MBF5922E. 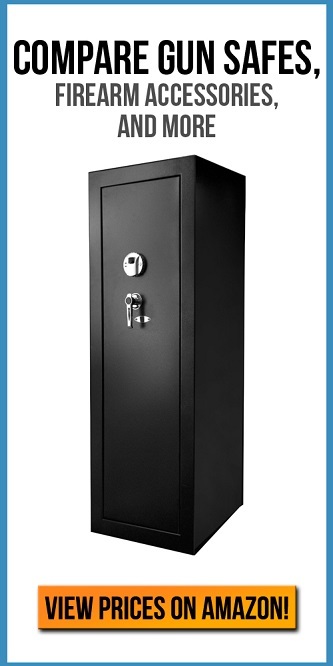 Should the safe be damaged and the damages fall under the warranty, the safe will be replaced. At no extra cost to you.